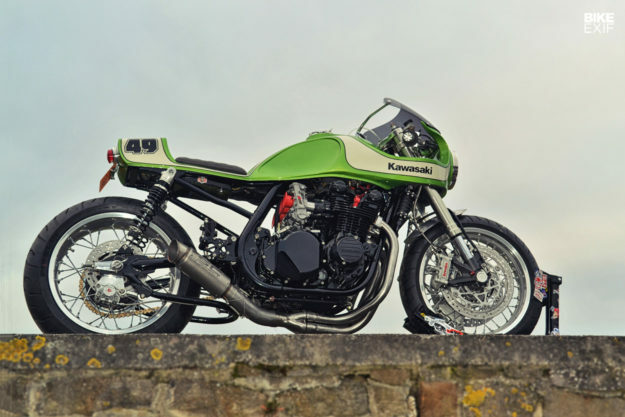 The Kawasaki Zephyr 750 is one of those under-the-radar bikes that deserves a higher profile. 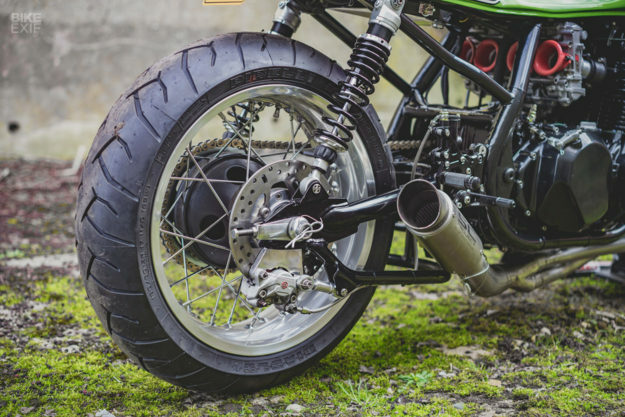 It played a big part in kickstarting the retro boom in Europe in the 90s, but mysteriously fell flat in the USA—despite outclassing the Honda CB750 Nighthawk on almost every front. 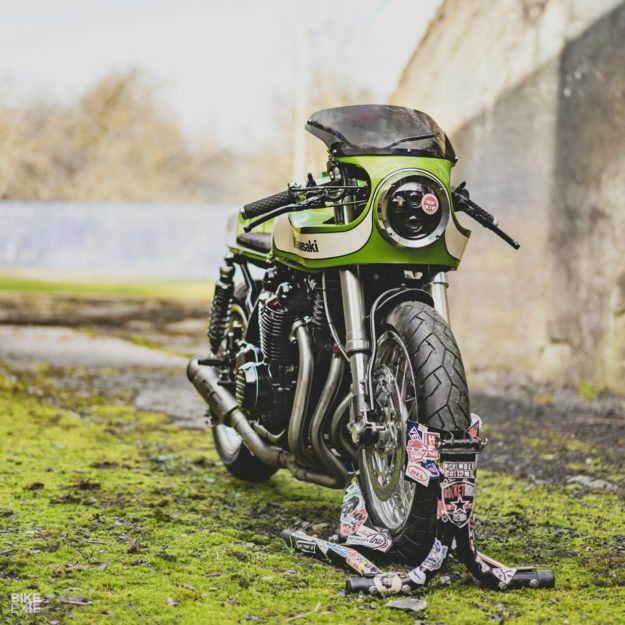 The Zephyr 750 has plenty of fans amongst riders in the UK, and two of those fans are Linda and Paul of November Customs. They’re based in a small town in the northeast of England, and run the business out of a tiny wooden shed in their back yard. It’s slightly smaller than a shipping container. Despite the cramped surroundings, business is thriving. Linda runs the company, while Paul chips in after-hours. 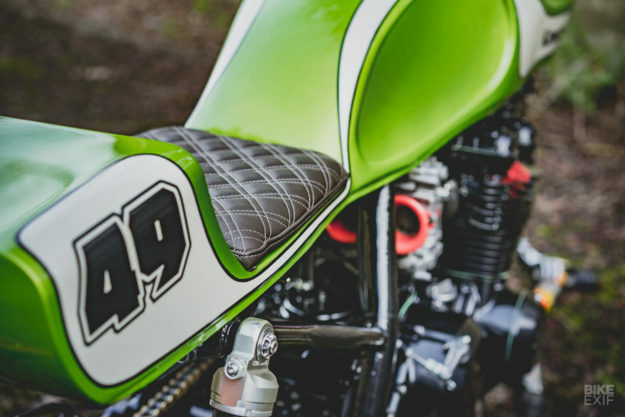 This 1991 Zephyr cafe racer is Linda’s personal ride—designed and built to suit her excellent taste. 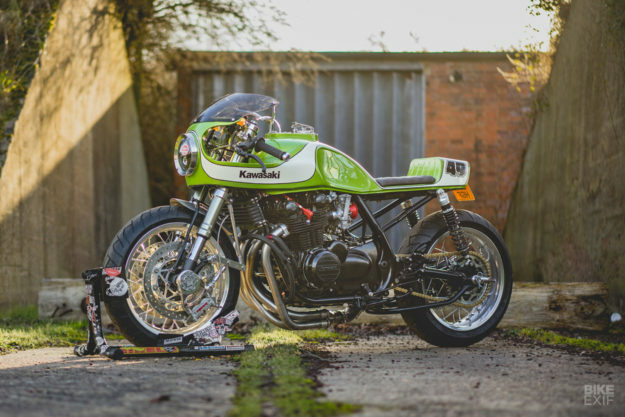 Like most November builds, the Kawasaki arrived as a partly finished project bike with low mileage. 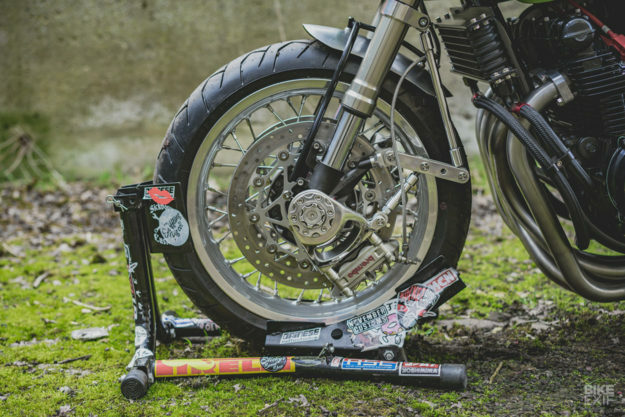 And the first change, surprisingly, was to a tubular Honda CB900 swingarm, to suit the frame better. The shocks are YSS: “We went for the ones without the piggy back reservoir, for a more simple look,” says Paul. Then a complete Ducati 848 front end was grafted on, using a Ducati yokes, along with clip-ons from a Ducati 748. 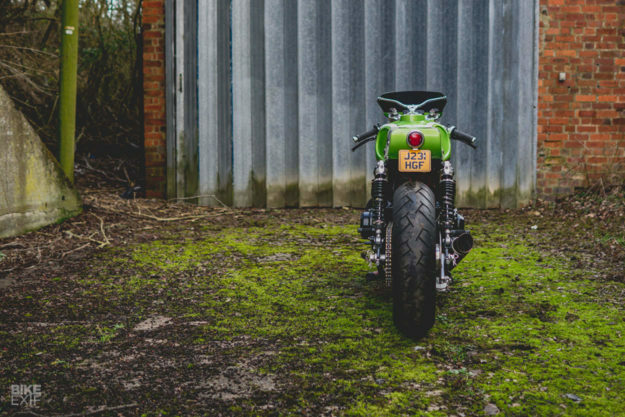 But the original Zephyr wheels then looked wrong at this point, so November tracked down a set of nearly new Triumph Thruxton 1200 rims. 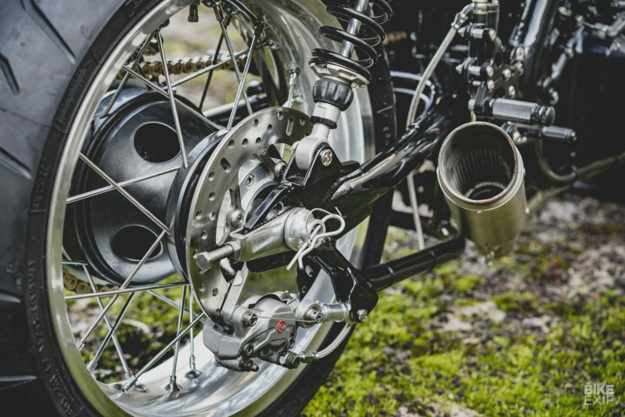 New Brembo discs were fitted—the front discs being from a Triumph 675, which bolted straight on. Aprilia calipers were used as they had the same bolt spacing as the Ducati forks. And those linkages behind the forks? It’s a mechanical anti-dive system. 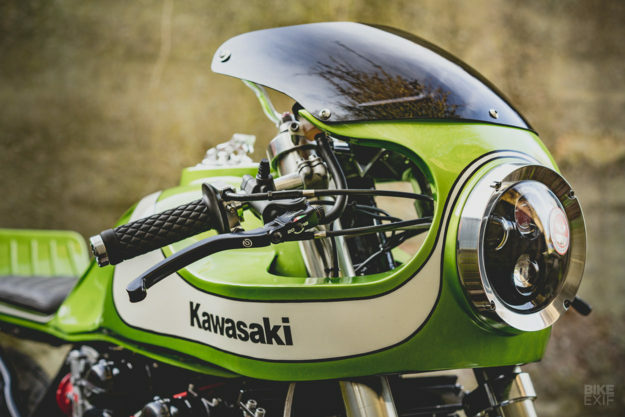 “This isn’t the first one we’ve done, and even though it was never the best idea first time round, we love the mechanical side of it,” says Paul. Brembo RCS radial master cylinders were used, keeping the Brembo theme going for the brake set up. 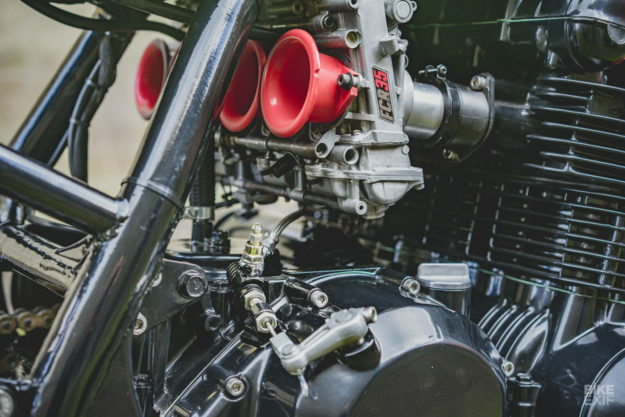 The identity of the exhaust headers is lost in the mists of time, but the intermediary pipe and muffler have been lifted from a BMW S1000R and made to fit with a little jiggery-pokery. 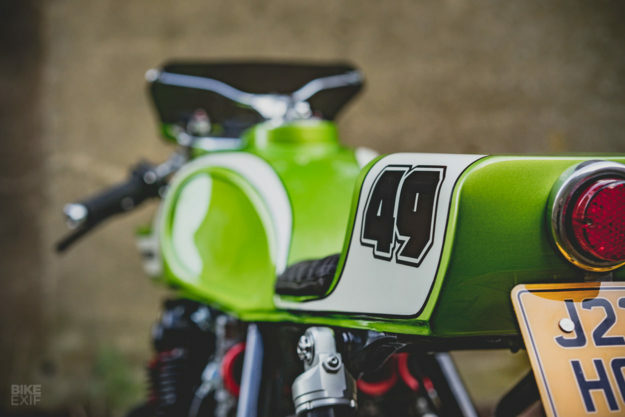 The tank is the original—but heavily cut and modified, and with the seam now extending into the seat unit. Then November welded a temporary frame to the headstock and used that to help shape and build the fairing. The screen was lying around the shop, but turned out to be a good fit after a session with the angle grinder. It’s attached using endurance-style quick release pins. To finish the Zephyr 750 off, Linda and Paul rewired it, installed LED lights in custom billet surrounds, and drilled and lock-wired many of the bolts. 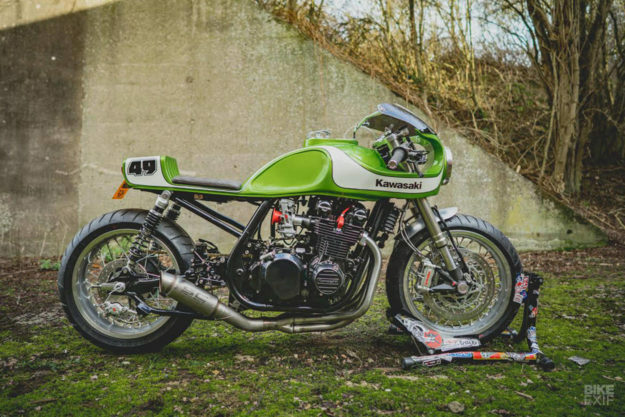 The delicious Kawasaki green paint was laid on and the bike dyno’d to get the flatslides into optimum tune. 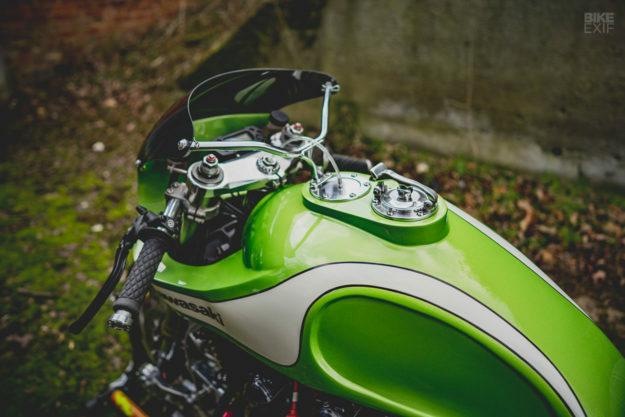 It just goes to show that you don’t need a workshop the size of an aircraft hangar to build a great bike. And if you’re in the US, you can still get a mint Zephyr for under $3,000. Anyone starting to get some ideas..?